They hide all the garbage, but this does not mean that they must be unsightly as what is contained in them. When it comes to preparing our favorite dishes, we need a kitchen that is sparkling clean. We can all scrub that oven, clean the countertop and dishes and then proceed to do our cooking. With all that done, there is still one aspect that people should pay attention to, and it is a clean and ideal kitchen trash can to suit all your home needs. If you have pets or children in your home, you will obviously have them running around, messing with anything they come across, and interfering with every bit of your kitchen. And when this happens, dirty surfaces and wet fingers will create lots of problems. Besides cleaning dirty surfaces and disposing of your garbage, a good trash can will prevent little rascals from getting in while at the same time keeping bacteria and odors away. When it comes to shopping for a trash can, there are numerous aspects that should come into play. Here are the two main questions you should ask yourself. 1. How big is your kitchen? The average household uses a 30-50 liters kitchen trash can, and the size of this accessory often depends on how often you use your kitchen. If you only use your kitchen once a day, you probably don’t need a big trash can. And depending on the size of your kitchen, you could go for a trash can with specific dimensions. If you have a designated spot for your trash can, it would be a good idea to take its measurements before making the purchase. A bigger kitchen will give you more options in choosing a trash can shape and size. On the other hand, a smaller kitchen with limited space will need a small trash can in order to utilize the limited space. simplehuman trash cans come in various sizes and shapes to meet your requirement. 2. What’s your preferred type of trash can? Trash cans could be sorted by the kind of lid they have or rather how they open. The most commonly used trash cans are step-to-open where one needs to step on a pedal to open and touch-free sensor cans which open based on your proximity to the trash can. Both trash can types are incredibly practical for instances when your hands are tied with chores, and they are more hygienic options since you will not touch the bin or garbage. The material from which the bin is made is an essential factor to consider. The most common elements are stainless steel and plastic, and the differences between the two types are price and quality. A plastic trash can, no matter how durable the manufacturer claims, will easily break more often compared to a steel trash can. Additionally, plastic tends to absorb odor more so even when it does not break — you might need to have it replaced after a while, something that you do not need with steel trash cans. With answers to these two questions, you can comfortably decide what simplehuman trash cans to look for and easily compare models. simplehuman is one of the most well respected names in the world of waste receptacles. They have dozens of models aimed at different uses. 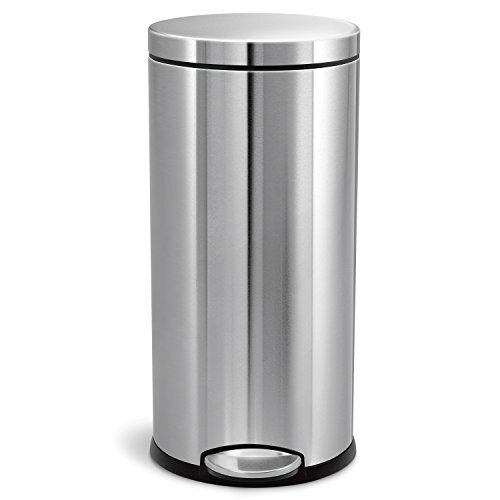 The simplehuman round step trash can is one of the most popular models. It’s the perfectly sized trash can for small spaces such as in bathroom, kitchen or a small office. This sturdy steel pedal ensures smooth operation each time you want to open the trash can. The best thing about this trash receptacle is that its classy round shape makes it look like any another appliances. 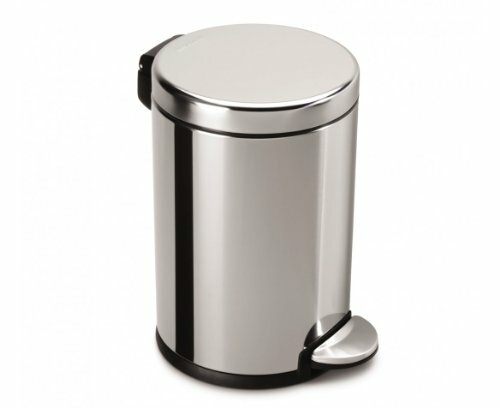 The simple round design of this trash can makes it perfect for bathroom or kitchen or a small office. 10 years warranty makes it one of the best products in the industry as most brands restrict warranty to 5 years. The strong steel pedal is designed to last more than 150,000 steps, which mean you can tap it 20 times a day for up to 20 years and it will still keep working flawlessly. Finger proof coating protects the trashcan from fingerprints, which means it will keep looking spotless and shiny. The removable inner bracket makes it easy for you to dispose of trash. It does not slam down which means it does not make too much noise while closing. You can use it for mild smelling diapers. There won’t be any odor. It is also available in 6 L capacity if you want a bigger size. It has mostly positive reviews and most buyers have found it to be excellent for a compact trash can. The lead will open and close properly each time due to its patented design. Some buyers have reported that it is not weighted at the bottom. The trash can tips forward when they step on it. Due to compact size, may make removal of the trash bag difficult. simplehuman semi-round kitchen step trash can may be the right trash can for you, but you’ll want to know the pros and cons, and then you can decide whether or not it’s worth buying. The best thing about the simplehuman semi-round kitchen step trash can is its durability. It is well-constructed and you’ll notice this as soon as you buy it. It is very reliable and won’t fall apart on you. The trash can has a semi-round shape designed and you can place the trash can against the wall. The simplehuman semi-round kitchen step trash can is made from durable plastic and is fingerprint-proof. The pedal allows you to easily and silently open and close the lid. The lid features a slide lock to prevent playful pets and children from getting into the trash. The wall bumper is a great feature, which will prevent the lid from banging against your wall. The trash can has enough capacity to fit 50 liter worth of trash. simplehuman semi-round kitchen step trash can has a warranty of 5 years and should last for many years. If you have a small living space, you can opt for the 40 liter simplehuman slim kitchen step trash can. You can place the trash can between cabinets and easily fit in tight spaces. It’s great to save those limited space. Similar to the 50 liter trash can, the 40 liter also comes with lid lock. It come with built-in wheels too. Based on user’s reviews, the pedal could be a bit sturdier. Some users complaint the simplehuman trash can is too light and moves around every time they step on the pedal. When it comes to truly premium indoor trash cans, bigger is better. 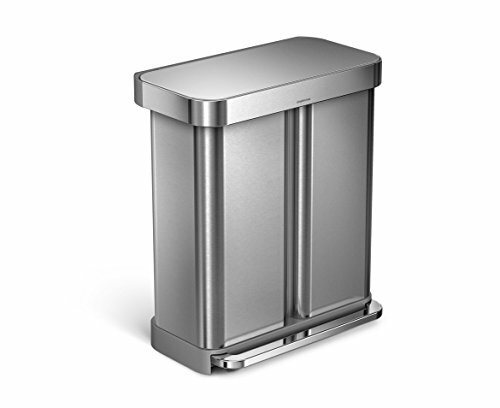 simplehuman Dual Compartment Rectangular trash can handle an entire family’s trash throughout a week. The trash can is made from stainless steel and featuring dual compartments for trash and recyclables. The long rectangular shape makes it easy to set up in a variety of different places. This shape allows it to slide into a variety of spots. Attached liner pocket dispenser (never have to look for them). Dual compartment design – one for trash and one for recyclables. Strong steel pedal to open the lid (designed to last 2 decades or more). Six colors to choose from. Nano-silver clear coat to protects from germs and fingerprints. Some users complaint the trash can is too expensive compared to other brands. Some were disappointed over the delaminated trash can finish. The simplehuman trash can features a compact and slim profile to fit into small spaces. The foot pedal is engineered to mimic the larger trash can functions of a much while offering ease of use on a smaller scale design. 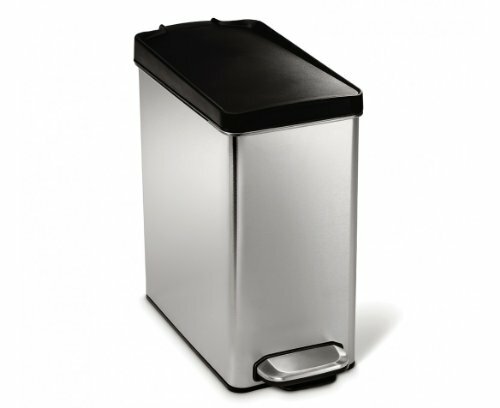 This simplehuman trash can model carries a limited 5-year warranty. The soft close lid allows for just enough time for waste removal or to drop waste inside. The quiet nature of the lid enables it to be used in a number of environments such as schools or offices. If it’s necessary to keep the lid from closing, placing one’s foot on the pedal can keep it open. The can measures less than 7 inches in diameter, giving it a compact design that can fit in small spaces such as bathrooms, next to kitchen cabinets or beneath desks. The pail on the inside of the can is able to function with regular grocery bags, but special trash bags may also be purchased if the budget allows. The sturdy outer stainless steel is resistant to damage and provides a great foundation for the trash can. The outer shell is also magnetic, therefore, magnetic notepads or magnets easily adhere. Paper grocery bags are the only types of trash bags that can be inserted inside of the pail without showing. Most bags are made to sit on the outer rim of the pail, making it easy to notice the white plastic. The price is higher than that of other brands selling small trash cans. Some may feel that the price is justified for the quality and amount of steel, whereas, others may find lower priced similar products more enticing. Finding the right compact and convenient trash can for the kitchen is a must for all homeowners. It is important for homeowners to have something they can use to dispose of their trash while keeping it out of sight. 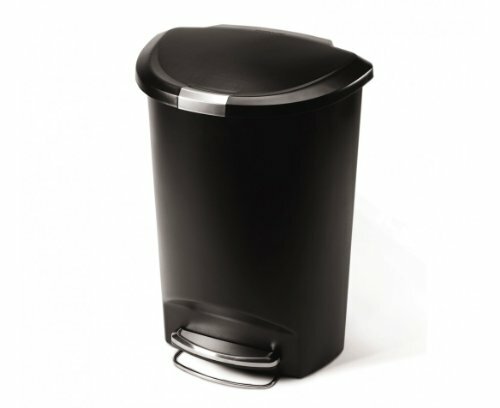 This is a stylish, and sophisticated simplehuman trash can. Not the right trash can for those that produce a lot of trash throughout the week.